Consultants: Associated Consulting Engineers (ACE) in Association with Russel & Axon Inc.
A major scheme intended to utilize the wastewater treated effluent in the cities of Makkah and Jeddah for beneficial use. The planned effluent utilization includes: irrigation of agricultural and landscaped areas; industrial water needs; various public and municipal needs including street cleaning, fire fighting. The project involved implementation of tertiary wastewater treatment, transmission systems and storage facilities. 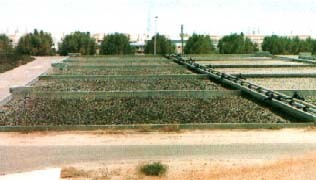 The tertiary wastewater treatment for both cities, included chemical coagulation, sedimentation, recarbonation, filtration, ozonation and chlorination. Additionally a reverse osmosis process was incorporated in Jeddah in view of the high salinity (6,000 - 7,000 ppm) of its wastewater. Irrigation of agricultural and landscaped areas; industrial water needs; various public and municipal needs including street cleaning, fire fighting. The project involved implementation of tertiary y wastewater treatment, transmission systems and storage facilities. The tertiary wastewater treatment for both cities included chemical coagulation, sedimentation, recarbonation, filtration, ozonation and chlorination. Additionally a reverse osmosis process was incorporated in Jeddah in view of the high salinity (6,000 - 7,000 ppm) of its wastewater. 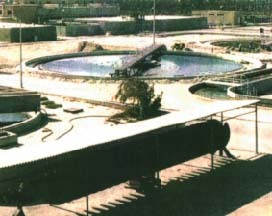 Storage facilities that incorporated a number of ground tanks each providing storage for 50,000 cubic meters of treated effluent.